Cooktop (3 burners) with Hood, Microwave, Oven, Refrigerator, Double Sink. 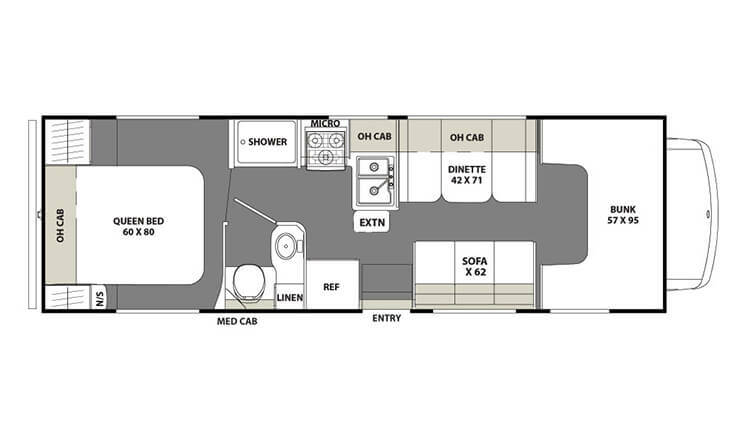 Sofa(bed), Dinette, Overhead Cabinets, overcab Double Bunk. Private Queen bedroom with bedside tables, overhead storage, and wardrobes; overcab Bunk; Sofabed. Private Bathroom with sink, vanity, enclosed shower, and storage.